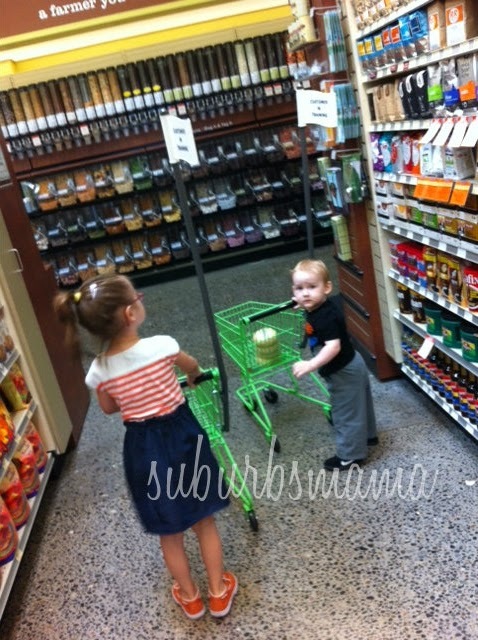 Yesterday, I was one of those moms you see in the supermarket with a screaming toddler! I don't know what happened, but I had to leave the grocery store because I just could not get him to stop screaming. I used to judge those mom's myself, I used to think "why doesn't the mom do something?" But now that I have been in those shoes, I will never again judge those moms. My daughter and son are different as night and day. My daughter used to have her binky in her mouth until she was 2. So there were never any tantrums as long as she had her binky. This little guy is different, he is still nursing, he hates bottles and will not even look at a binky. If he wants to be comforted, he just grabs his blankie and runs to me. Before we go anywhere, I always make sure the kids have napped, are fed and the little man nursed. We had to make a quick run to the grocery store to pick up a few items. Little Em wanted one, so naturally the little man wanted one to. I figured since we only have a few things to grab, they might as well both get the carts. However, little man had a hard time steering it, he kept crashing into everything. Which is where I come in. I steered him holding the long pole... Everything was fine for the first few aisles, then he realized I was steering and had a melt down, he wanted to do it himself. But when I let him do it himself, he kept getting stuck, so he got frustrated and would start screaming. At one point he even sat on the floor, covered his eyes with his hands and was crying. I tried talking to him, comforting him, but nothing worked. At that point I was ready to just carry him and have little Em use her shopping cart, however, He didn't like that and started screaming even more. Oh boy. I grabbed the bagels and coffee and ran to the checkout with a screaming toddler. Many people were understanding saying their kids went through that stage. But I still felt bad and kept apologizing, because most likely they were judging me in their minds... Probably thinking that I am a bad mother. We were out of there and guess what? He was back to normal. No more screaming or crying. I am not sure how to handle these tantrums. Do any of you moms have any advice? This is SO appropriate for me today. Something similar happened with my 4YO yesterday. 4!!! I feel your pain. It used to happen to me on a regular basis when mine were very small and didn't get their own way! to the point of rolling on the floor screaming. The best thing I did was to walk away - not too far - just far enough for my little one to realise he wasn't getting the attention he wanted. He would quickly stop crying , get up and follow us. I just ignored other people, i'm sure they thought I was some sort of heartless B****, but I knew my children and knew this would work. I did hate it tho'. Thanks for all your comments :) My 4 year old is always great, she knows to behave otherwise she will be in time out when we get home. My 18 month however is another story. Part of it is because he is so still young. He thinks he can get anything by screaming. I know how you feel! Don't feel bad! If people are judging you, it just means they never had children (or had them so long ago they have forgotten that sometimes, there's nothing you can do). The thing I do is just promptly leave where I am. Even if i have to leave a store without my purchases, I do. I just need them to know that the behavior will not be tolerated. I think it depends on the age, too, but when you can't reason with a small child, you just need to remove them from the situation. You did a good job! My life exactly. My son is an angel, so calm, easy-going and i can reason with him easily. My daughter is on the other end of the spectrum. She falls apart if she doesn't get her way. She is 20 mons. What I do is buckle her in a shopping cart asap, sometimes even before entering the store. She may not get out or we will go home, not by a snack etc. Stick to it. It's a very, very hard job, and know that you are not alone! ignore the crazy looks..one day they will understand just like we do now. I honestly felt like I did not want to go anywhere anymore, just stay home and wait for the hubby and then do all my shopping and errands. But life goes on and after all the great encouragement, I feel that I can do it! Thank you all so much!! i'm late to this party, but i'm a mom of 4 (ages 10, 7, 5 &3) so I can relate! I have to say, there is a good chance that your son is especially intelligent. and the smart ones are harder, because you have to show them the "tough love" at so much earlier an age! at 18 months, a smart kid will start that first real battle of the wills, and it is *essential* that you give him the boundaries to help him know that you are in charge. this gives him a sense of wellbeing and safety, even though it angers him! stick to your guns, and don't be embarassed! tell him camly, "Mommy can help you steer, or you can [be carried, ride in the big cart, etc.] But you have to stop screaming if you want to push your own cart at all." Then, be ready to follow through. It's so hard, but if you lay that foundation early, it really, REALLY pays off when they hit the "terrible twos and threes!" By then, they know whether you mean business or not....good luck!!! !